Archaeologists believe what they originally thought was a Viking burial ground in Cumbria, may actually have been a 10th Century market. 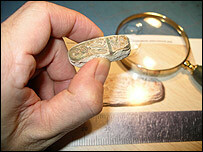 Excited experts unearthed a wealth of treasures at the site, near Barrow. They were particularly impressed with a merchant's weight, which is the size of a finger and shows a dragon design with two figures. But after a month of study, experts have moved away from an initial theory that the site was a burial ground. The dig has unearthed several more metal objects which indicate the site was used as a market place. Barrow archaeologist Steve Dickinson says more time is needed to determine the exact purpose and use of the site. He said the British museum had already offered to help local teams. Mr Dickinson also said he is in talks to set up a discovery centre in Dalton, which will house an exhibition dedicated to the site. The weight is currently with the British Museum for conservation.